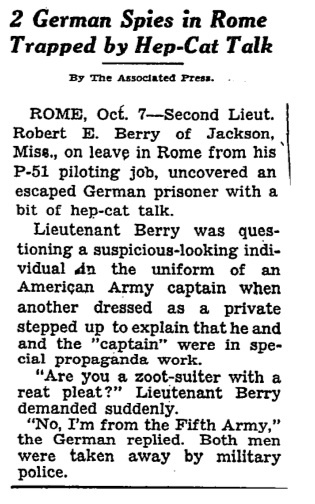 and a little New York Times story from 1944: hipster jive nabs Nazi spies! This entry was posted in Hipsters. Bookmark the permalink. Straight from the fridge, Jim! How terrible, to be arrested just for being square. Have you read the hipster kids book Suzuki Beane? If not, you totally need to find a copy and read it (if I’m in Bloomington again some time, I’ll let you read my copy). It’s sad that it is so rare — I picked it up with a bag of other stuff for a dollar at a book sale, and only found out that it was out of print when I tried to get a copy for a friend.